Built between 1516 and 1522, the Sponza Palace was the centre of medieval Dubrovnik. 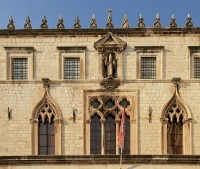 Apart from featuring the customs office, the palace once also housed a number of the Dubrovnik Republic's state offices, the mint, the bank, the treasury, and the armoury. A mixture of Gothic and Renaissance architectural styles, Sponza is one of the most beautiful palaces in the city and has been well-preserved so visitors today can still enjoy its stunning facade. It has been suggested that the architectural style of this well-preserved old palace gives some indication of what the public buildings in Dubrovnik may have looked like, before they were destroyed in an earthquake in 1667. Although this natural disaster caused considerable destruction to Dubrovnik, the palace itself was largely undamaged. Today, it houses the Dubrovnik archive, which contains 7,000 volumes and about 100,000 individual scripts. The atrium of the palace is an art gallery which showcases various exhibitions from contemporary artists as well as those who were prominent in Dubrovnik's past.